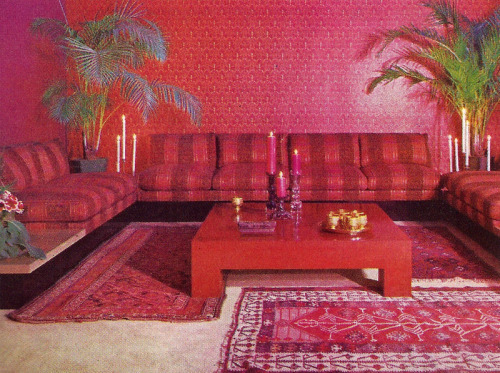 I think if there's one decorating detail that defined the 1970s -- besides the sometimes retina burning colors -- it's the plethora of plants that were found in homes during this time. 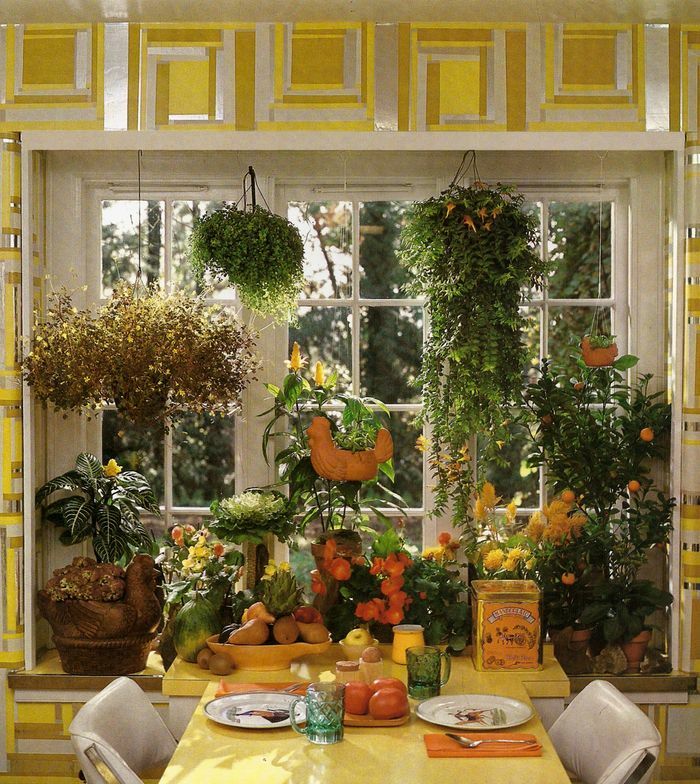 Look through any modern home magazine or site today, and most of the time you're going to see one or two carefully placed flower arrangements or potted plants in a room and sometimes, none at all. 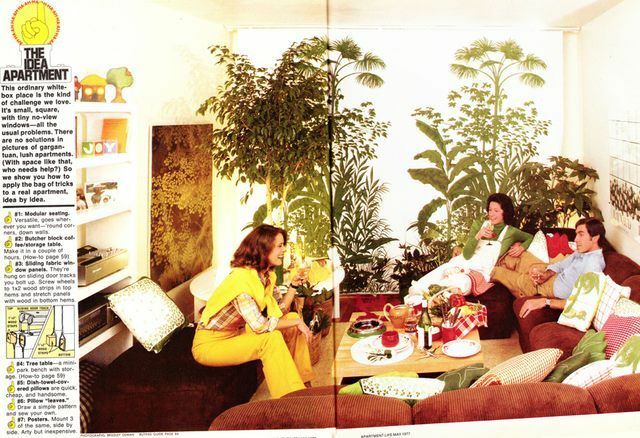 But when I go through photos scanned from 1970s interior decorating magazines or books, I'm sometimes amazed by the amount of vegetation that filled homes -- and public spaces -- back then. I'm not sure why plants were so big during this time. 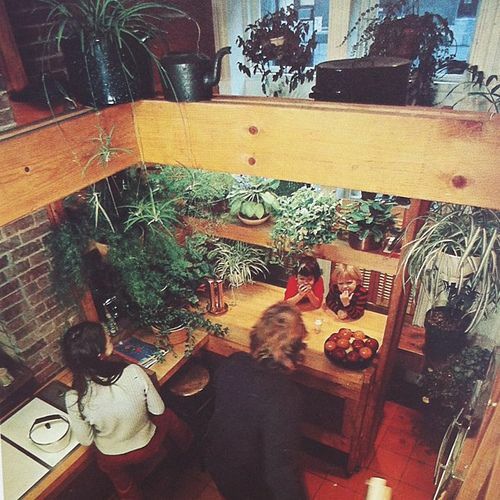 It could be because the world was becoming more aware of environmental issues (Earth Day was first celebrated in 1970) or it may have been a residual effect of the hippie love culture for peace, love, flowers, and all living organisms. 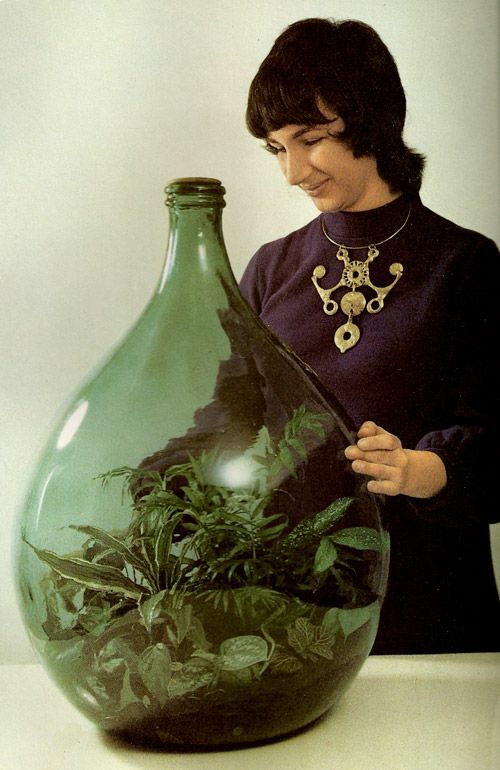 Whatever the reason, it's definitely not a bad thing to love plants, but let's face it: some people went overboard like the lady in the photo above. 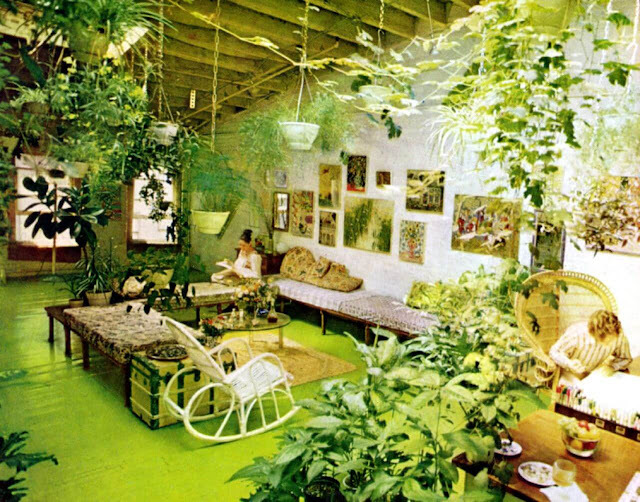 Don't get me wrong, I like plants and flowers, but I can't imagine keeping up with the required watering for some of these homes now preserved online. The one popular plant I remember most from my '70s childhood is the spider plant. I don't know why, but I always had one in my room. They would look cool for a while (especially when they grew "baby spiders") until they inevitably contracted some kind of fungus or parasite (from where, I have no idea -- our house and my room was clean) that would leave bumps all over the leaves and we'd have to throw it out. Anyways, here's a selection of photos found on Pinterest and Flickr when plants of varying degrees ruled the premises. I'm suddenly feeling nostalgic for another spider plant...wonder if Target sells them. 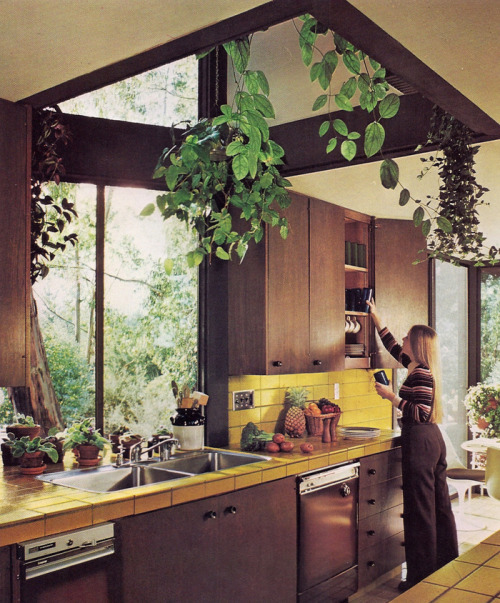 Another kitchen ruled by plants. 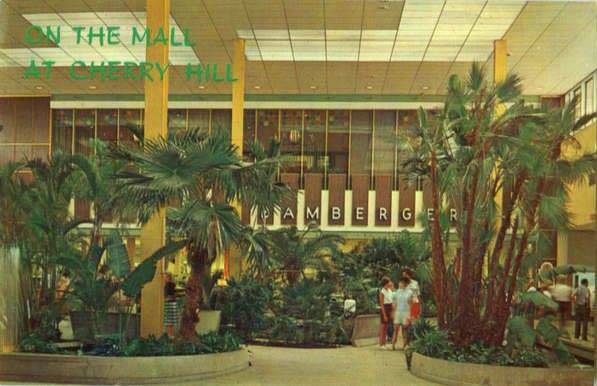 As mentioned, the plant craze wasn't reserved just for homes -- your local mall in the 1970s most likely contained jungles such as this one above. I hear a few small children went missing after wandering into that display. Food court or greenhouse? By the way, I looked up the The Old Spaghetti Factory because I've never seen one around here. Turns out they're mostly on the West coast and in the Mid-west -- and they promise that you feel like you're "stepping into another world" when you eat at one of their restaurants. Each location contains "antique lighting, stained glass displays and an old-fashioned trolley car that doubles as a dining hall." Sounds like my kind of bag! 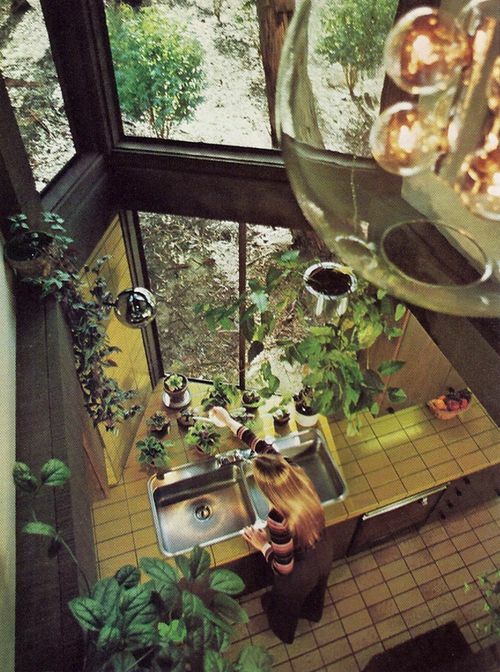 Even supermarkets had hanging plants! 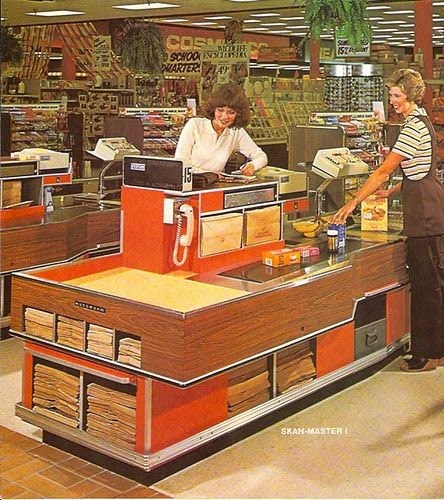 This image is from a supermarket post I did a year or two ago. 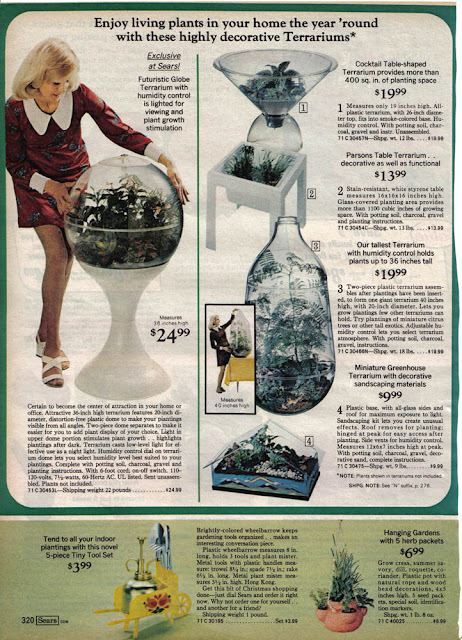 Oh, and then there were terrariums, another popular home decor item of the decade. 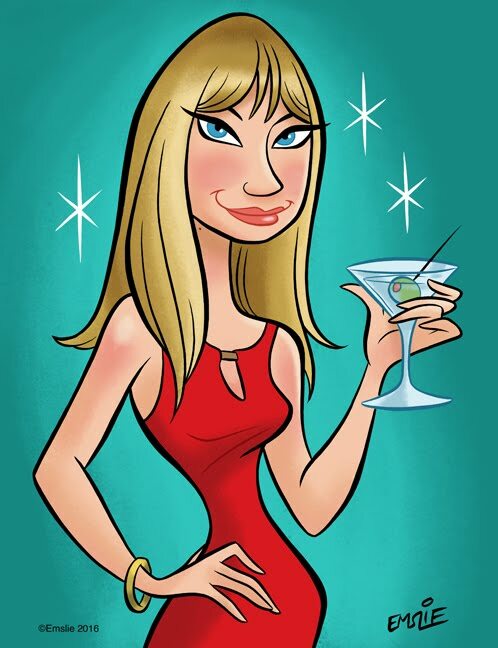 What a shame to think that massive bottle won't be holding wine anytime soon. 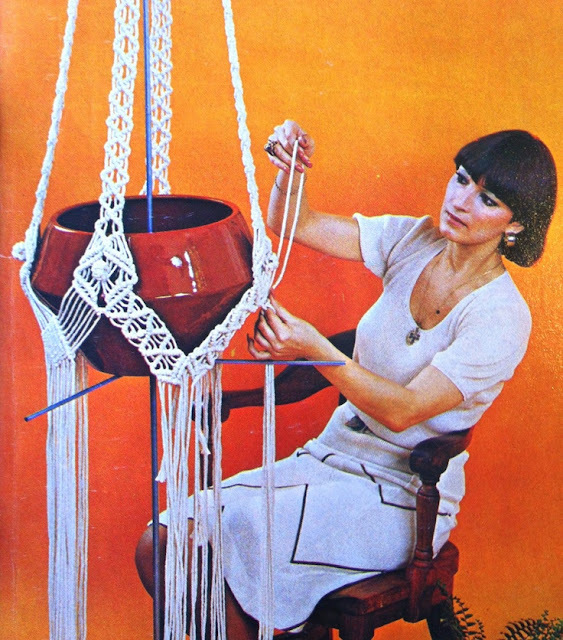 Macrame plant holders...now this is where I really draw the line with putting too many plants in one home. 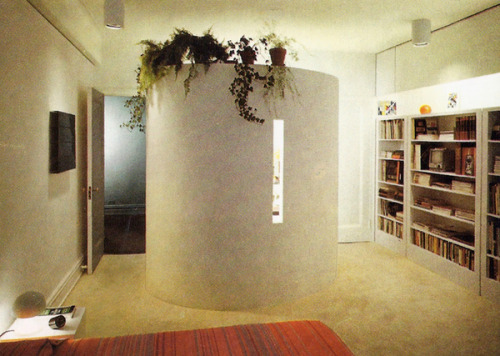 Seems like a good place to also stop this post's plant obsession. When the houseplant fever his me early last spring, I had to go to Amazon to find spider plants. All the usual retailers had pothos, peace lilies, various cane/bamboo topiaries, and just TONS of succulents, but no good, old fashioned spider plants. I got 3 different varieties there. Even one with curly leaves. Thanks, Anonymous - good to know. 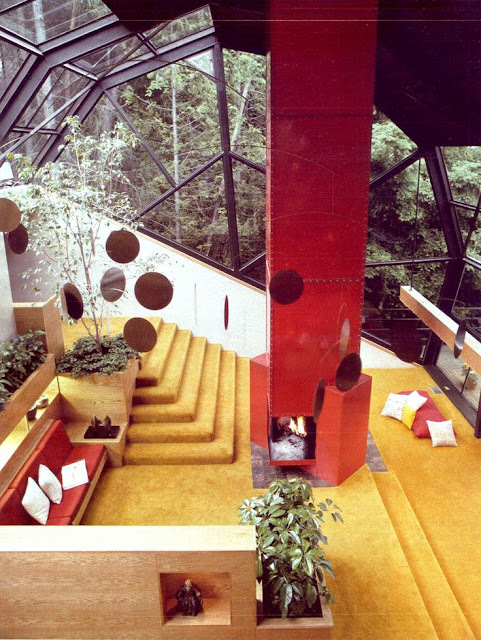 Designers went from the sterility of the '60's to the "organic" design of the 70's. 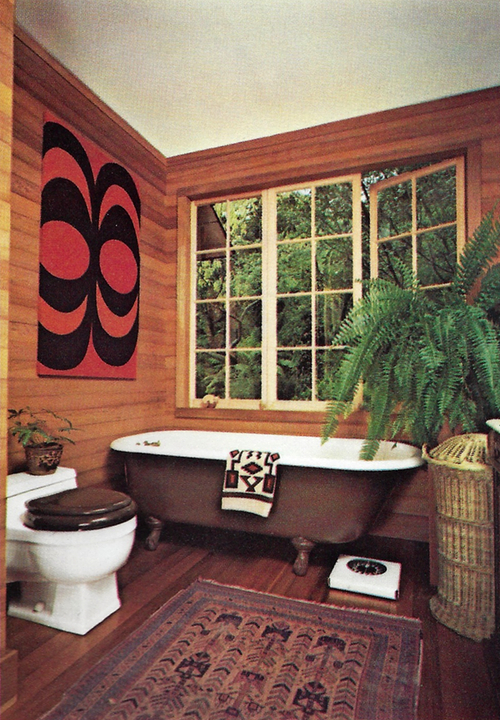 I think we all have memories of a room with too many plants when we were kids; mine was the bathroom since the thought was that steam would help keep them alive. There were at least 6 in that one room. 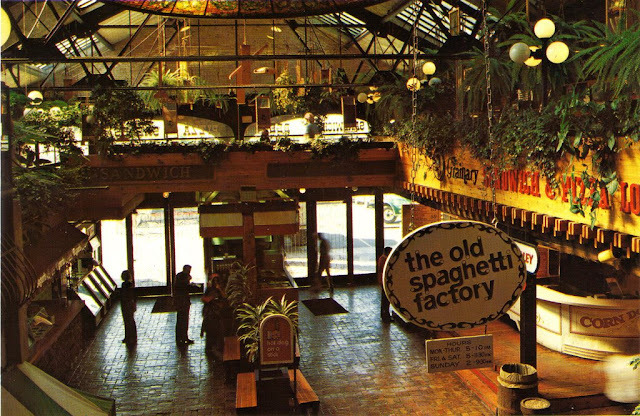 The Old Spaghetti Factory is still around with the trolley inside. Food is passable and pretty reasonable. If you ever make it to PHX, there's one downtown. Back in the 80's I worked for a plant care company. 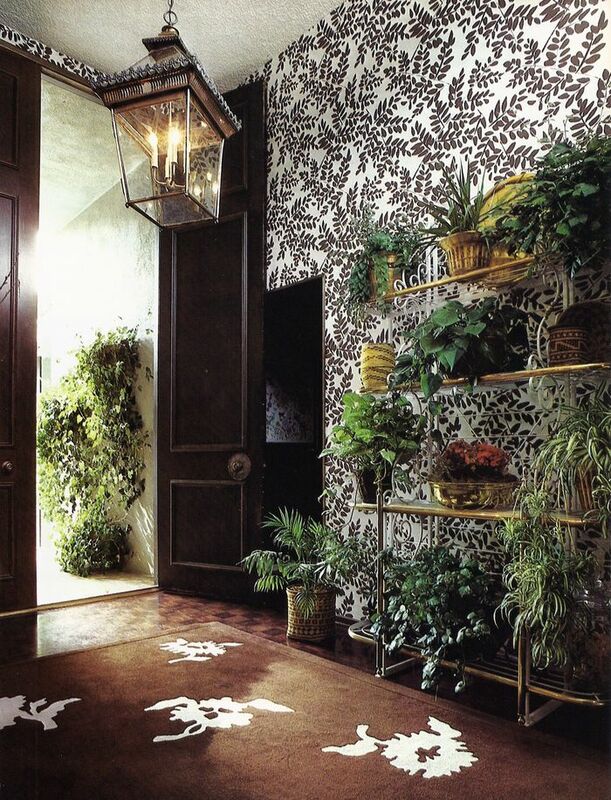 I would go to different business and tend to the tropical plants that were placed there. 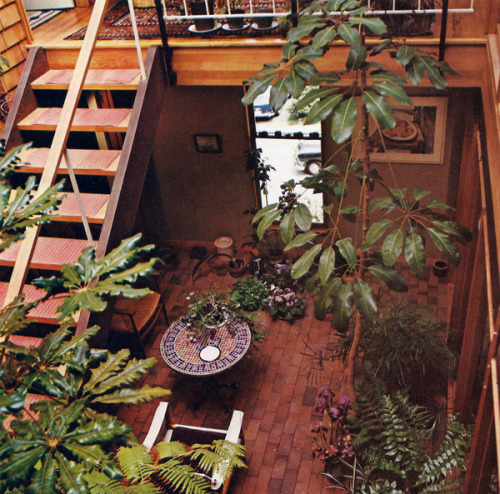 I remember lugging around a big 35 gal trashcan for water and a ladder to get up to the higher plants above. So many plants that really didn't belong where they were.